the Show Cover of 4-5 oz. vegetable tanned strapping leather. 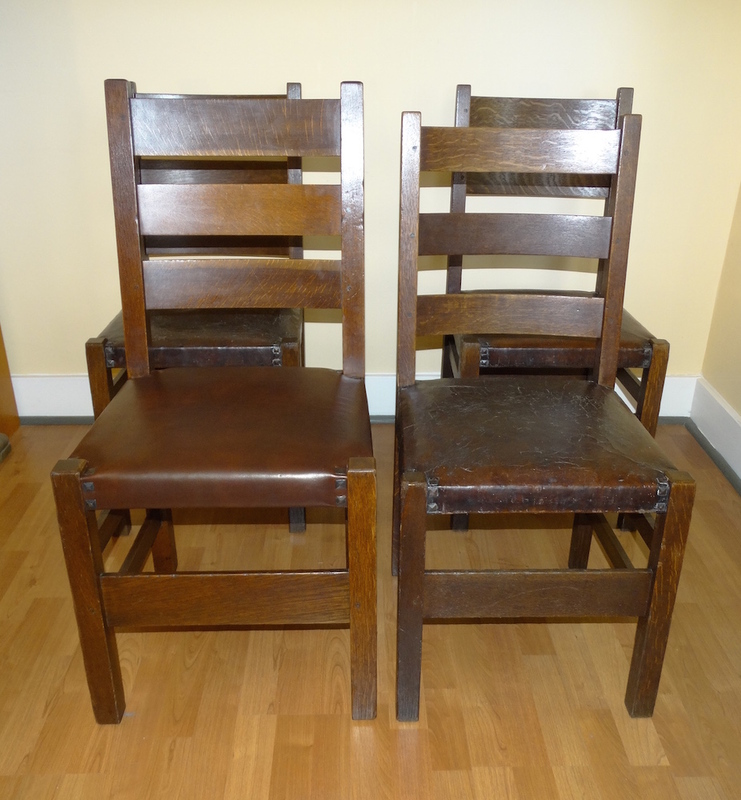 Above, the original leather, much aged, and the new leather. The new leather is a bit pinker than shown — fluorescent lighting! 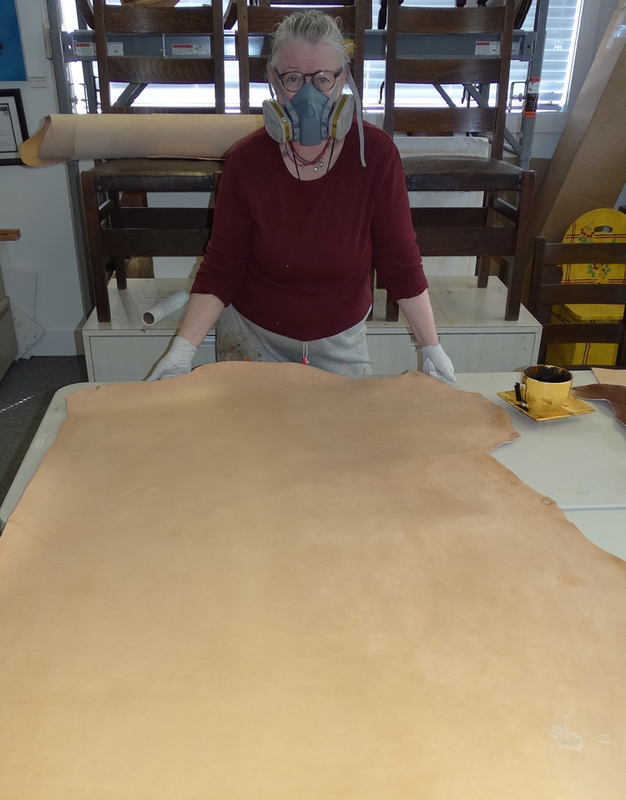 the leather, above, with Fiebing Dye Prep. Human hands and factory conditions can add unseen grime which interferes with dying. 1-2 coats on bits of leather that were unusable before we found the one that worked. 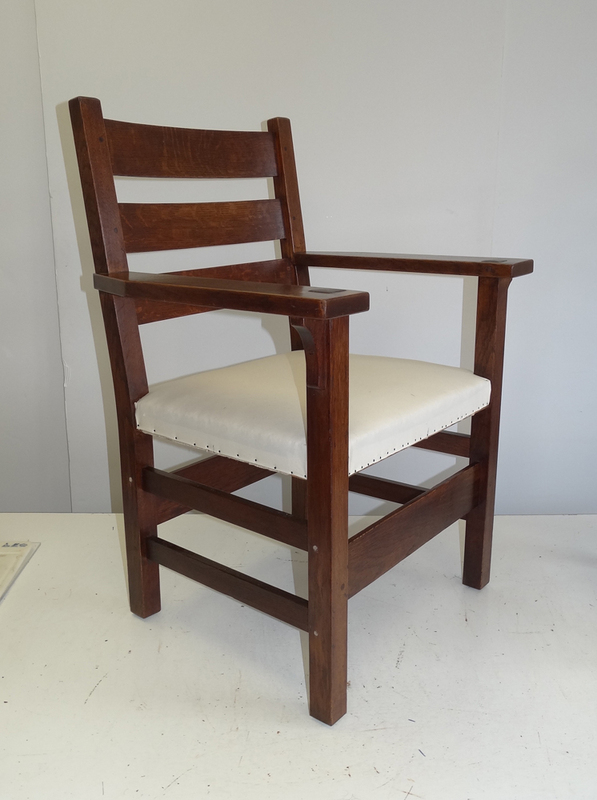 the other Stickley pieces our client owns. A glamorous life, this messy finish work! requiring deep rubbing to penetrate the skin even after cleaning. first coat left the skin coloring a bit uneven; we let it thoroughly dry overnight. 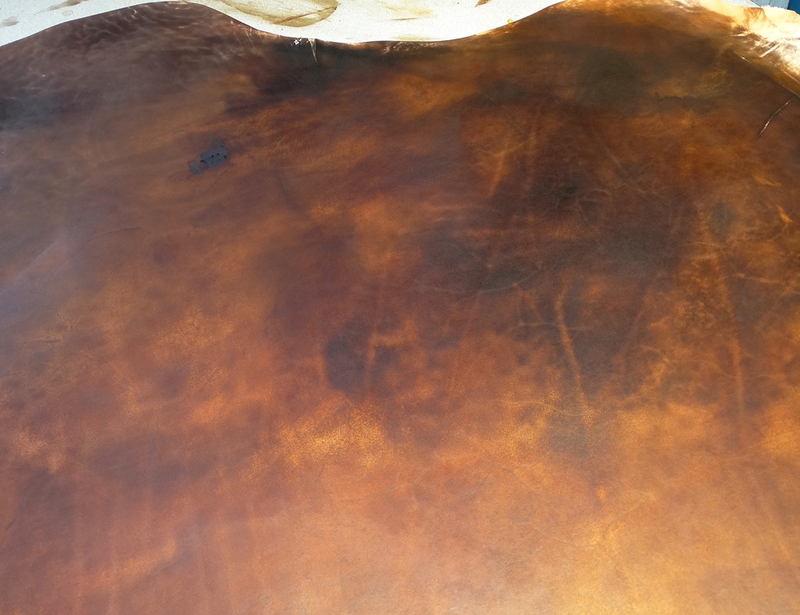 After each coat dried, the surface was polished, removing excess color. 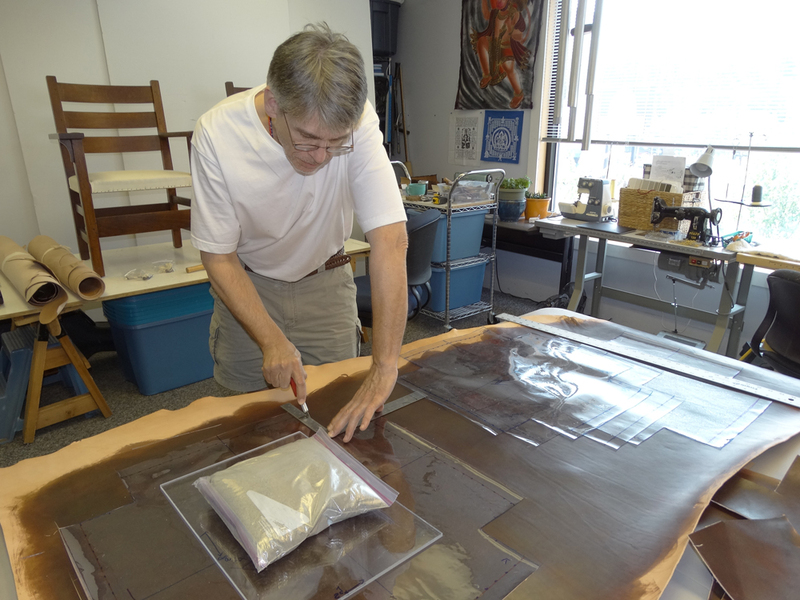 The second coat deepened the color saturation and evened the dye pattern. 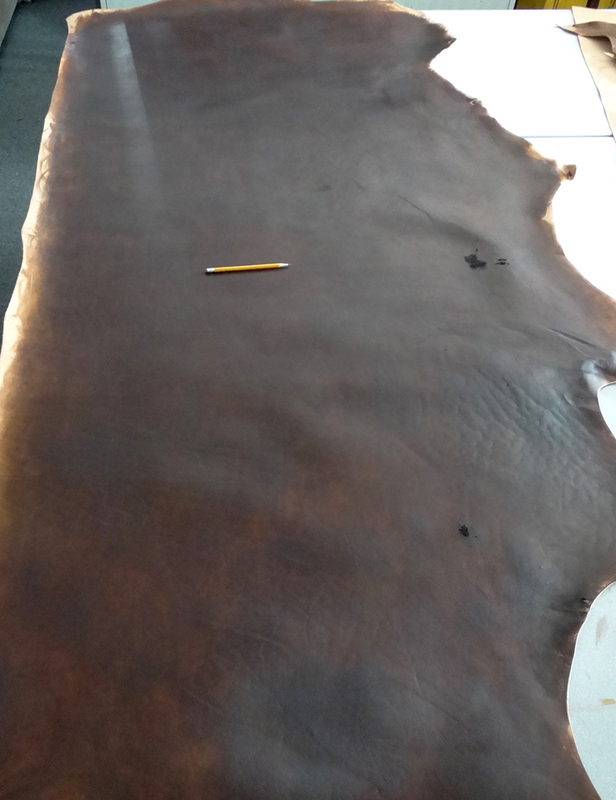 Dying done, the leather is ready to be upholstered after another 24 hours and a good polishing! The dark black spots are blemishes which we must avoid when upholstering. The original decorative nails are quite bent and must be carefully straightened. 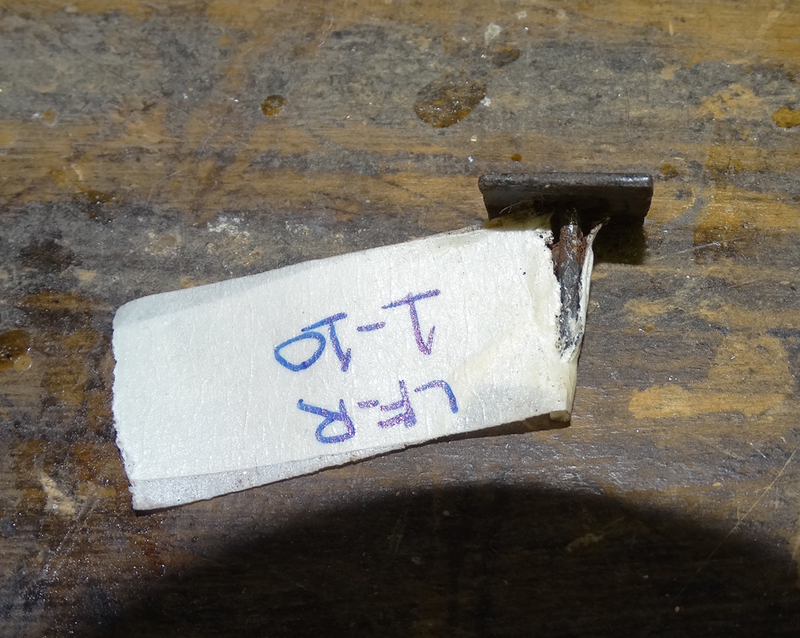 Again, each nail is labeled to be replaced into the original conserved hole. again until the shank is straight enough to be replaced into the chair. 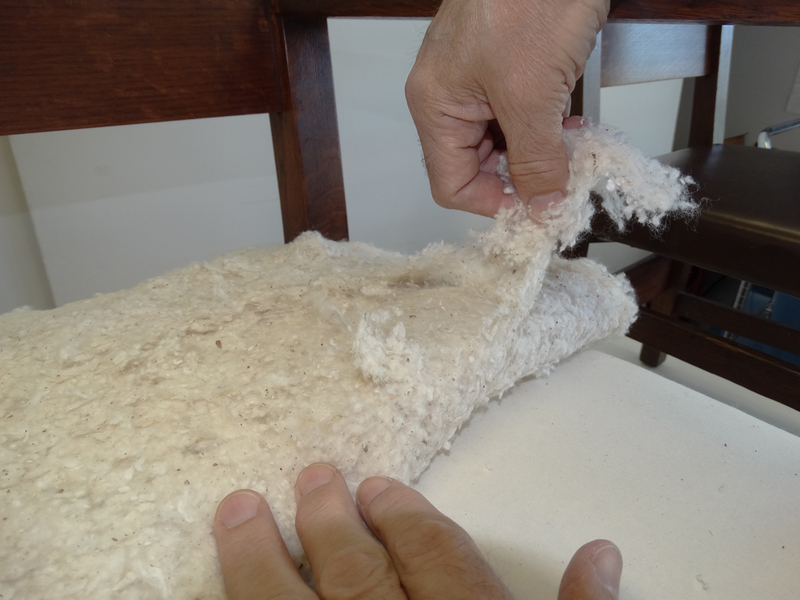 Sometimes a gentle tapping is needed to make the top cap lay flat again. We are ready to begin; all preparations in advance are complete. noting center-line, placement and shape. 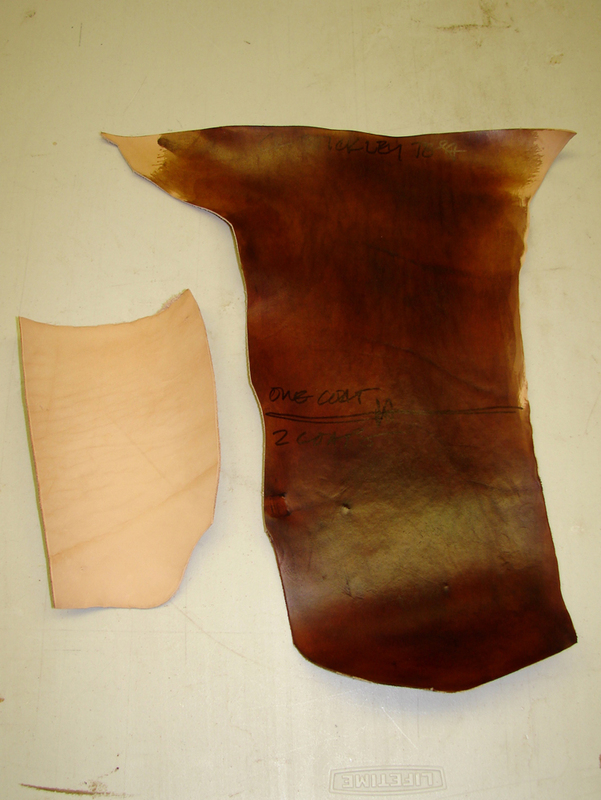 Leather was carefully cut to avoid blemishes. The edges were dyed, then waxed and burnished. the batting to be as he remembered the seat. The cut seat show cover is placed onto the seat and tacked into place. 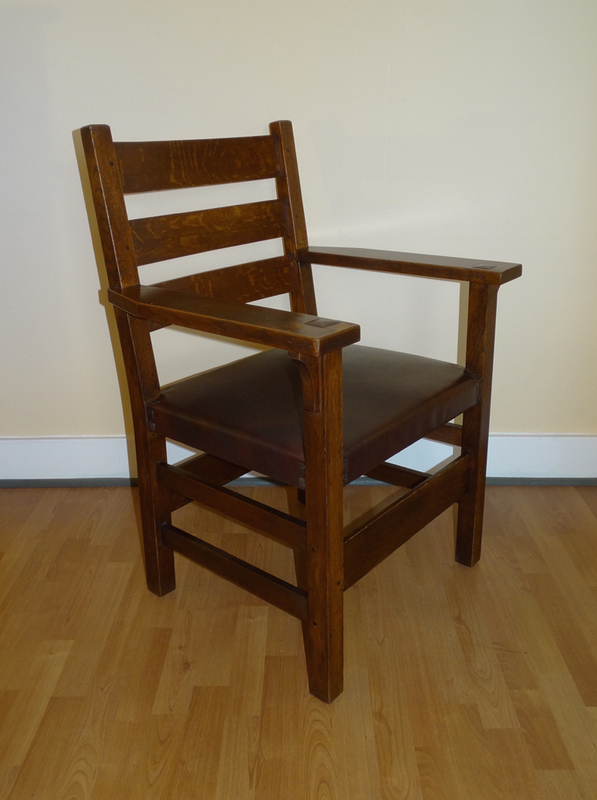 The original Craftsman paper label was too old and brittle to be replaced onto the chair. We made a photocopy of the original label, and added our conservation date. 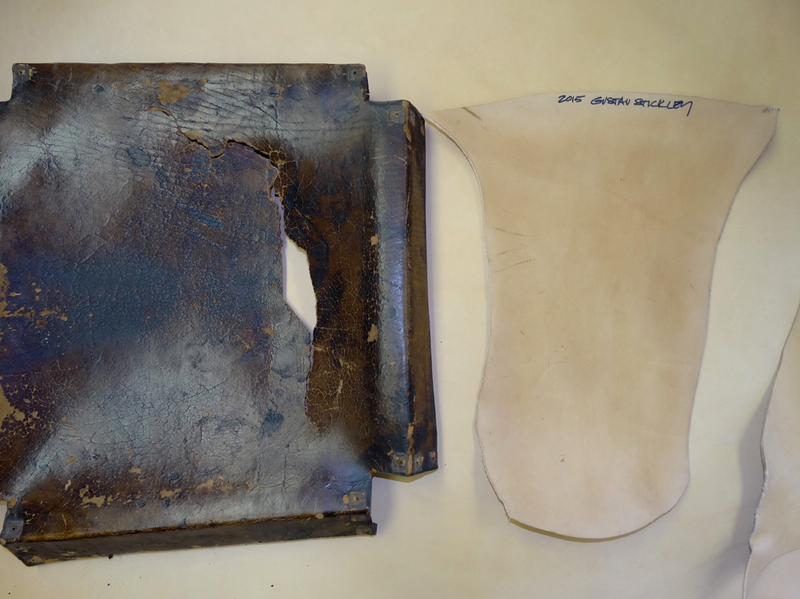 This was placed onto the underside of the chair, and the original was placed into a protective covering and given back to our client along with other bits of historical material. The seat is ready for decorative nails. Pilot holes are drilled into the conserved original holes, and the decorative nail ever so gently tapped into place. 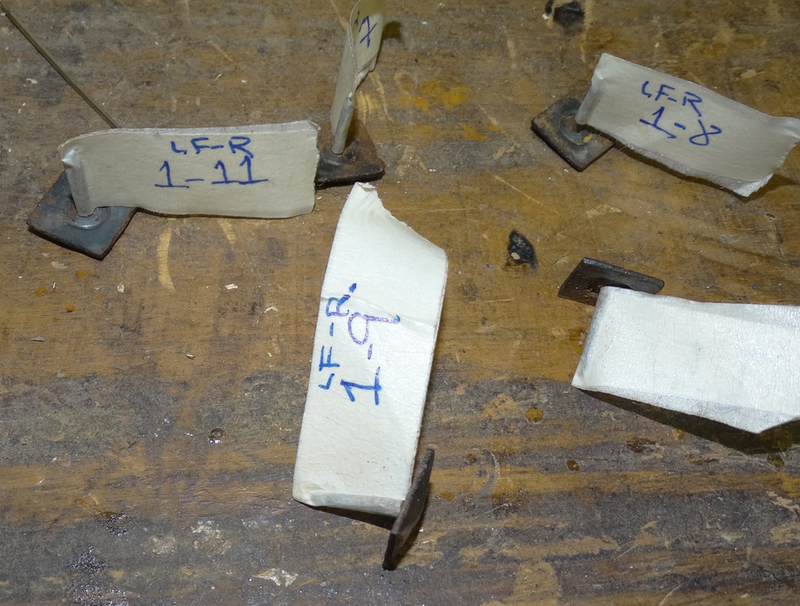 In the four chairs conserved, only one decorative nail was broken and was repaired by our blacksmith! 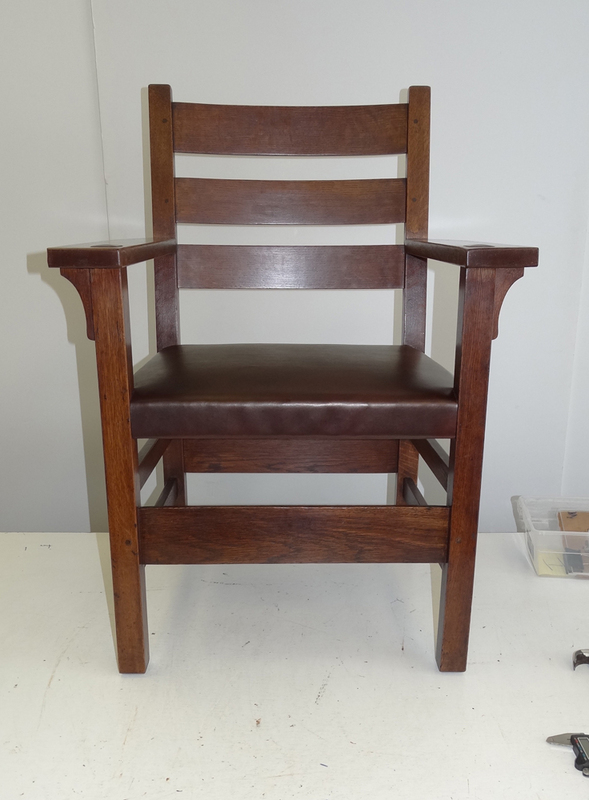 Completed conserved chair is ready for action at the dining table! 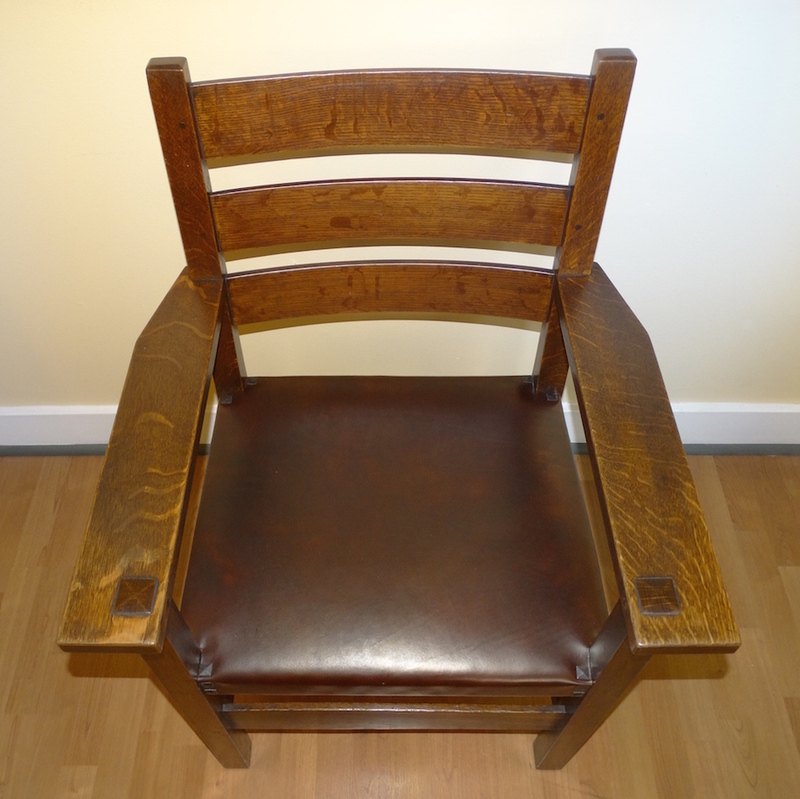 to older Stickley original leather! This entry was posted in antiques, chair, Interim Report, preservation, reparation, restoration techniques, upholstery, wooden objects and tagged 1910, antiques, arts and crafts, chair, conservation techniques, dye, Furniture Conservation, Furniture Restoration, Gustav Stickley, Interim Report, Ladderback Arm Chair, leather, MPF Conservation, Pacific Northwest, Portland, process, reparation, restoration techniques, show cover, strapping leather, traditional varnishes, upholstery, Upholstery Portland Oregon, waxes, wooden objects and tagged 1900. Bookmark the permalink.